Top 10 Upcoming Mobile Phones in India (December) - Technology ke lihaz se India kafi better hai that's why kafi Brands apni Technological Products India me launch kar rahe hain un me sabse Products Mobile Phones hain to aaj Top 10 Upcoming Mobile Phones in India December 2018 btaunga. Mobile Phones ka use Call & SMS ke saath different things me badh gaya hai that's why Mobile Phones Companies bhi New Technologies introduce karwate huwe kafi ziyada Mobile Phones launch karti hain, December ke Top 10 Upcoming Mobile Phones in India ki baat karte hain. Last kuch months se kafi ziyada Mobile Phones launch ho rahe hain or December ke Top 10 Upcoming Mobile Phones in India ki baat kare to December month bhi different nahi hoga B'coz December me bhi kafi Mobile Phones launch hone wale hain. Top 10 Upcoming Mobile Phones in India December 2018 ke saath jo Expected Date hai wo just Expected hai Expected Dates ko confirm date na samjhain. Nokia 8.1 ka kafi time se wait kiya ja raha hai or Finally Nokia 8.1 6 December (Expected Date) ko launch hone wala hai, Nokia 8.1 kafi ache Specs ke saath ata hai & overall it is going to be a Great Phone. Asus Zenfone Max Pro M2 Mid range me Killer phone hone wala hai B'coz M1 bhi Amazing Mobile Phone tha now M2 ziyada better hoga to ziyada Amazing Features milenge and yeh phone December ke First Half me launch hoga. Oppo R17 Pro me Water Drop Notch milti hai, Backside par Triple Camera Setup milta hai & CPU - Snapdragon 710 Processor milta hai, Overall agar is Phone ki Price better rakhi to it's such a Great Phone. One Plus 6T New Mobile phone nahi hai but yeh New Edition hai OnePlus 6T McLaren F1 Edition launch hone wala hai, Basically McLaren ne Partnership ki OnePlus ke saath or yeh Awesome phone McLaren ki branding ke saath launch hone wala hai. Motorola ki taraf se 2 phones expected hain Moto G7 Plus/Moto G7 Play, B'coz Moto G7 Certification ho gaya hai, Now Motorola koi 1 ya dono Mobile Phones launch kar sakta hai. Samsung A8s pehle China me launch hoga then India me launch hoga, Samsung A8s ka sabse Highlighted Feature yahi hai ke Samsung ne Hole Display provide kiya hai that's why Samsung A8s me bazel less Display with Small Doted Notch hogi & isko Infinity Display Name diya hai. Huawei Nova 4 again Punch Hole Diaplay wala Mobile Phone wala hai, Huawei Nova 3 India me 2 months pehle launch huwa and it was one of the Best Price to Performance ratio phone, Nova 4 ki bohat aggressive Price thi or Spcification ache the, Now Huawei Nova 4 ke Specification nahi maloom But Nova 4 me Punch Hole Display hoga. Lenovo ne November me 2 phone launch kiye after 1 year nearly, And December me bhi Lenovo ki taraf se 1 Mid range launch hone wala hai, Lenovo K5x me Qualcomm Snapdragon 636 & Front side par Dual Camera Setup milega, Lenovo ki taraf se yeh aik acha Mobile Phone hai with respect to Price & Specs. Samsung kuch Budget & Mid Range Mobile Phones laane wala hai December me But this not 100% confirm, But Samsung ki A Series & M Series ke kuch A30, A50 & M10, M20, M30 yeh kuch Models ke name btaye jaa rahe hain But 1 se 2 Phones zarur launch honge Samsung ke Budget/Mid Range category me. Lastly yeh btana chahunga keh 1 Phone Gamers ke liye launch hone wala hai, Now yeh Phone Xiaomi ki taraf se ho sakta hai Xiaomi Black sharp se, yeh Gaming Phone Nubia ki taraf se bhi ho sakta hai. Asus ne Gaming ne Phone launch karke sabhi Manufactures ke liye doors open kar diye hain Gaming Phones laane ke liye But yeh Expected hai December me Gaming Phone launch hoga. 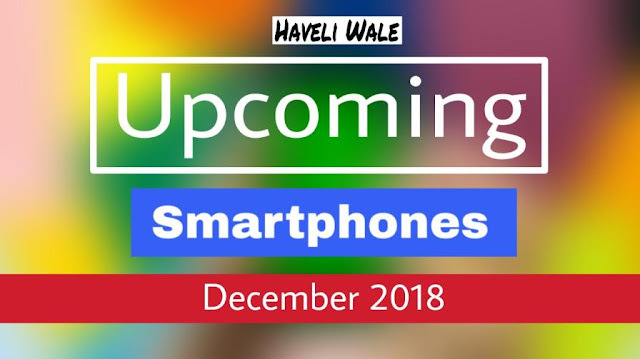 Yeh hain Top 10 Upcoming Mobile Phones in India December 2018, yeh sabhi phones ki date Expected hai koi confirm date nahi hai, hopefully apko yeh Tech Information Pasand ayegi or yeh Top 10 Upcoming Mobile Phones in India December 2018 ke related kuch information mili hogi.